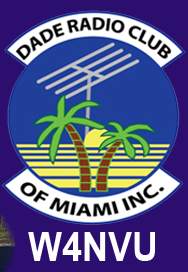 August 2014 Minutes – W4NVU – Dade Radio Club of Miami Inc.
Meeting was called to order at 19:32 with 31 present. We have a quorum. Julio presided over the meeting and welcomed everyone. The meeting was not broadcast live on the air tonight from the EOC. There was testing being conducted in another room tonight. Everyone took turns and stated their name and call sign and what they did that was Ham related since the last meeting. Julio welcomed everyone again and that we have a guest speaker tonight. Brandon will give us a presentation on being a Net Control Station. Julio reminded everyone present tonight to sign in. The minutes were done by Brandon for last month’s meeting and were posted on the website. Julio asked if there were any objections to the minutes as posted on the website. There were none. Lloyd made a motion to accept the minutes, seconded by Brianna. The minutes are accepted as posted. Corresponding Secretary: Lloyd has mail and he will distribute it. Treasurer – Brianna advised that she is collecting dues for 2014. Please see Brianna to pay your dues. Website – Julio advised that it has been updated. The meeting notice is not correct and he will get it corrected. Club Elmer/PIO – Miguel advised that everything is good. If you need something, contact Miguel. For PIO he has nothing to report. Newsletter – We are looking for writers. It will be out before the next meeting. Bill HR 4969 was discussed about antennas in HOA’s. We need everyone’s support. Go on the website “Gee hind” and find your representative. There is a sample letter too. Steve came in later and also spoke about HR 4969. Miguel spoke about the Hambulance. We are making progress. Ben Nemsner donated a lot of equipment. Ray said we should but a sticker on the Hambulance for Ben’s company. Miguel said he was looking into getting the wrapped. Any donations, see Miguel. Steve spoke about his ISS contact and Richmond Heights Elementary School. Ham Night Out will take place on Oct 24 from 800 to Oct 25 1200 at Castello Hammock Park, 22301 SW 16 Avenue, Miami, 33170. Camping is available. He is working on the food. See Miguel if you are interested. Lloyd is the new chair for Hamfest. It is going well. He is waiting for the artwork. Armanod’s wife was in an accident. He is donating 4 tickets at each Hamfest. The 224.200 – Julio advised that it is still at his house. Still working on new sites. The 444.200 – Carl advised that it works. A link is being worked on. The Digipeater – 144.390 – Same problem. Needs a place. Emergency Committee – Miguel announced that the next meeting is September 8th at 6:30 PM before the regular meeting. Carl announced that he needs 3 or 4 people in the Radio Room to mount 6 radios. Contact Carl. Brandon gave his presentation on Net Control Stations and how nets work. It was a very informative presentation. If anyone is interested in running a net, see Brandon. Thank you Brandon. Ray suggested that we have a “question of the night”. Brandon made a motion to adjourn, seconded by Virgil. The DRC meeting was adjourned at 20:38.